Reports are flying in from all over the world. It’s a bug in the Windows Activation server. Don’t panic. It’s not your fault. Right now, based on personal experience (see below), this activation red herring hasn’t made any difference at all in the way Win10 Pro works. Details in Computerworld Woody on Windows. It appears those affected are users who upgraded using older Windows 7 and Windows 8.1 product keys. Devices that shipped with Windows 10 Pro appear to be unaffected at this time. 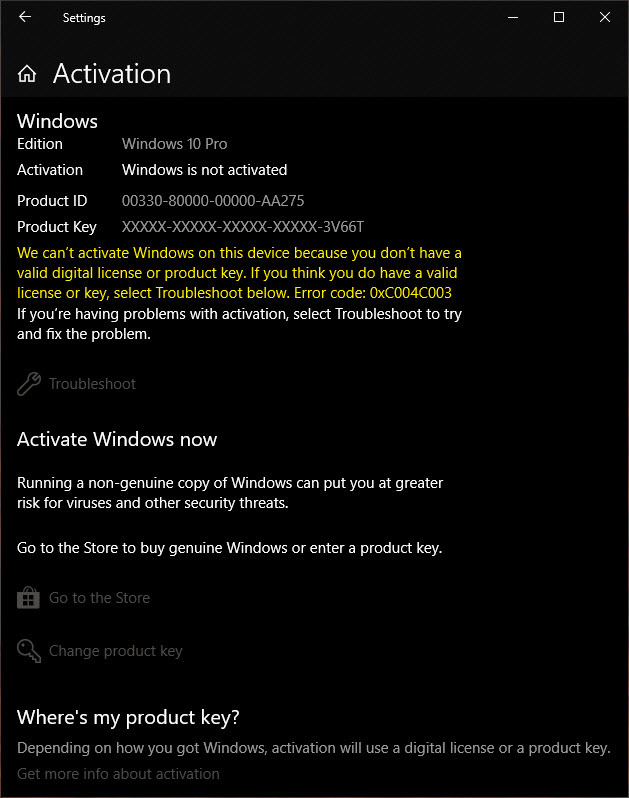 Edit 1: Users report that Windows activation troubleshooter might say You have a Windows 10 Home license but you are running Windows 10 Pro. You are advised to ignore that message and wait for the fix. Methinks the offal has hit the fan. Bet you didn’t know how reliant you are on behind-the-scene activation checks. Mcinwwl 5 months, 2 weeks ago. I caught Gunter’s Post earlier and just had a quick check around Win 10’s Pro 1709, 1803 VHD, 1809 VHD All activated fine they have Win8.1 Pro Keys in the BIOS and none have been upgraded from Home to Pro and all about 30 days behind with updates except 1809 which is Winver 17763.55. Curious logged on here at 0430MST no problem since and I believe the Activation/Licence check is one of the services that runs on Start/Boot. Good morning from NYC. I have this problem, but i didn’t upgrade my license from Windows 7 or 8.1. I purchased this machine with a Windows Home license (no choice) which i then upgraded to Windows 10 Pro (64-bit). So it seems that some of coming from Windows 10 Home might also be affected. I panicked until i remembered to “ask Woody.” This site is invaluable. I will sit tight until Microsoft sorts this out. I just hope no functionality is disabled. Can you click Start > Settings > Update & Security > Windows Update > Advanced options and see if you have settings available to defer updates? Also, type About in the Cortana search box. Under Windows Specifications, does it still say “Edition Windows 10 Pro”? My Windows spec is still Windows 10 Pro, version 1809, installed on 10/3/2018, with OS build 17763.55. It does not let me update my product key, but you know that already. I apologize for the delay in answering and for being “anonymous.” I’ll register as soon as my morning phone calls are finished. Interesting that Windows would be telling a bunch of people with Windows 10 Pro that they only have Home licenses, right when a big update is (over)due for release. Realistically speaking though, shouldn’t failed activations and “non-genuine” Windows errors automatically prevent you from receiving updates? I’m curious if this particular activation server issue is related to the Windows Update system in any way, and whether the erroneous license errors would actually change people’s ability to receive or defer updates. I have one PC that says the activation I have is not valid for my product. I had Pro but it now says I have Home. I’ve never had Home and got the original Pro activation under the “first year” free upgrade from Win7. Even though the Activation page says I need to activate the Home edition, the About page shows I have Win 10 Pro and all the settings that correspond to a Pro license appear to still be valid. This PC has been running since 4PM EST on 11/7. A reboot doesn’t resolve anything. I have another PC that says it can’t reach the Activation Server. It has been running since 8PM EST on 11/7. Not sure if eventually this PC will lose its activation. I have another PC at another location that is still showing an active PRO license. Not sure if the inability to reach MS Activation Server is ISP dependent but this third PC is also behind a domain proxy. All three PC’s got Pro activation under the free upgrade from Win7. It seems that not only do we have the issue with the Activation Server but also a greater concern that once activation is available which product will be licensed (Pro or Home). I can recall as an Insider the concern with cloud-based activation model. I hope this ends well. If not maybe MS could just provide free upgrades from Home to Pro! This morning I saw a notice in the lower right corner of my screen: Windows is not activated. I built this shop box from scratch, with a purchased license key card. After I retyped in the key, activation succeeded. We shall see if it happens again within the next two days. No previous upgrades occurred on this machine; it was a new install. Other server issues going on too – TeamViewer has been unusable for quite some time now due to server issues and their Status Site (link below) shows major outages. Let’s hope this isn’t anything malicious… TeamViewer is used by MANY large corporations and countless home users! Teamviewer was not working for me early this morning but it is working now. Red Ruffnsore reporting from the front lines. That was me that posted the TeamViewer note and I had just logged in specifically to post that, but when my comment didn’t appear instantly I checked and saw that I wasn’t logged in? Weird! Somebody should contact Al Gore to let him know his internet is experiencing some really strange technical difficulties before it’s too late! I tried calling him myself but the emergency contact number he gave me appears to be disconnected. Edit – TeamViewer’s working here now too! Wouldn’t be surprised if Microsoft messed with the digital license database to kick pirated copies flooding Asia. Anyway, half of the Windows 10 Pro fleet here is having activation issues. At least, rebooting removes the disturbing Activate Windows watermark. Anyway, Satya Nadella and Joe Belfiore messed up big time and it’s about time they resign. This is what happens when you fire your VERY EXPERIENCED team of testers. 5 users thanked author for this post. Agreed. I think Microsoft just needed more testers, so they switched everyone to Home. You may be more correct than you realize. What did you miss the memo from MS that all Pro are being sent to Home since need more lab rats…tester..to test their MS. May be MS forgot to sent it out to everyone. Or may be it is a new feature that will be used for X to do Y….Ms explaining their bug. I wasn’t aware that Windows 10 had to phone home to maintain its activation. That makes me feel quite uncomfortable, sure we’ll all be renting it soon enough if they have their way! Or maybe I’ll just stay on 8.1 for as long as possible. If you read some of the leaked documents from MS on dark net, Windows as service is heading to being rent or lease option in the next few years. Just had my first user tell me he is getting the activation message. We have a lot of older pc’s that we re-imaged with Windows 10 and used the Windows 7 product key sticker to activate so this will be fun. Thanks much Woody. I had not heard about this yet and saved me a lot of head scratching and aggravation this morning. It pays to check in first thing every day at Askwoody! Activation troubleshooter eh? Affects just the systems upgraded for free, eh? It’s not new news that most Windows systems check online regularly to determine whether they are allowed to remain activated. My worry is this: Will older systems develop this problem, which is of course “not your fault”? We can easily work out what that would mean. it means we will fully embrace Debian and have already started down that path. I have one Win7 computer that is always offline except to update software or do monthly backups to an online service. That computer has never exhibited a need to re-activate Windows. The other Win7 computer is online most days. Several months ago, that one began to do some of the things people mention, especially a little message in the lower right corner that said that this copy of Windows in not genuine. Once or twice is showed me a darkened desktop. A little research suggested that the problem arose from the fact that I had the Windows Update service disabled (at the time). But it was disabled on both computers, and again, the one machine was seldom online. A little further research indicated that a particular update triggered the problem and should be uninstalled. I did that and it worked. I no longer have the details regarding that update. If Microsoft really must continually re-activate our computers then they truly have us all by the short hairs and the only answer will be to move on. If Windows 7 becomes deactivated prior to depreciation, it is convenient for Microsoft to upgrade users to Windows 10 without difficulty. 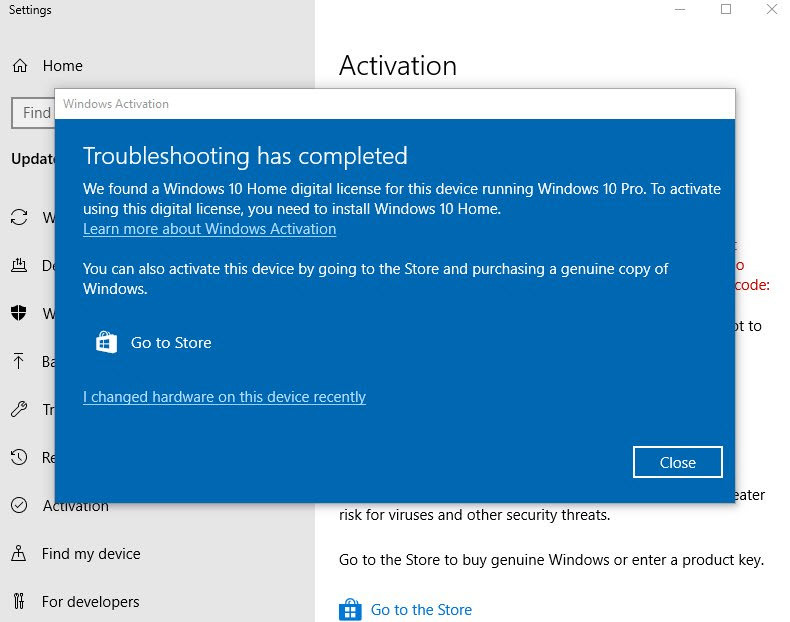 This incident shows that if Microsoft activation servers have “problems”, intentional or unintentional, will cause Windows 10 (and may be other softwares requiring activation to function) to be deactivated. I would have thought that these activation problems should be long in the past for Microsoft, apparently it is not. It also shows that Microsoft has control over the activation status of many copies of Windows 10 running on users’ computers, after the copy has been activated. It can remove the activation at their discretion at any time and there is nothing you can do about it. Hope for the best. Prepare for the worst. W10 Pro. Update from 8 Pro. Clean install. No issues. Clean install of 1709 updated to 1803 on 10/31/18 W10 Pro with a retail license not OEM. No activation problems and Settings>WU>Advanced<Feature Update deferral settings (set in group policy) are still present. Of course. A non-activated Win 10 Pro computer can be run normally for up to 30-days as a free trial period, courtesy of M$. After 30-days, it will automatically become practically unusable … and maybe self-destruct = kidding.? A non-activated Win 10 Ent Evaluation Copy can be run normally on a computer for up to 90-days. Free Win10 pro upgrade opportunity? Not something I’d normally think about but home isn’t fit for purpose. And Microsoft – besides the post – keeps quiet. Incredible. What a total mess they became. Unfortunately when this happens, and it happens randomly, some users actually buy another license from Microsoft. One of my customers did so during a previous activation server failure. He has a legal Windows 10 OEM sticker on the side of his case. He purchased the PC from my company. I find it pathetic that Microsoft readily accepts payment for a new license when the existing one is valid, and the error is theirs. He thought that he did something wrong and had to pay. How many others have done the same thing? Last year I bought a laptop with Win 10 Home. First thing stupid me did was buying an upgrade to Pro, via the Windows Store. Somehow, they charged me 3 times. They knew it was not right, because I got immediatly a notification saying something went wrong and I paid a couple of times. However quick the paying was, the refunding of the extra paid money cost weeks 🙁 They just don’t care about clients. I wonder if this might be Microsoft’s attempt to close the upgrade loophole? Up until now, it has still been possible to use a Windows 7 or 8.1 key to activate Windows 10. But they’ve obviously broken existing systems too, which is worrying. Windows 8.1 may be just as bad in terms of this issue… though it was not hit with this bug this time, I think they all phone home for license verification every so often, though I am hazy on the details. By my way of thinking, MS is free to do whatever they want to verify the authenticity of a product key prior to activation. Once MS has declared that it finds the license valid and it allows the software to be activated, it becomes the official OS of the PC. Any OS has only one job, and that is to enable the hardware to serve the needs of its owner (as defined by himself). It’s never in the PC owner’s interest to have a process running on his system whose only purpose is to find some excuse to harass that owner in Microsoft’s interest. It’s using the resources of a paying customer’s PC to do work on behalf of Microsoft and possibly against the interest of the person the OS is supposed to be serving. If MS validated the license when it was first activated, it should be a done deal, forever considered a valid and duly licensed installation. They had their chance to say no when the initial activation took place, and if they didn’t make use of that opportunity, too bad for them. Not being able to force every possible pirate to pay up is simply the cost of doing business if the alternative would mean having the OS violate its duty to serve only the owner of the hardware it is installed upon. This has nothing to do with the text of the EULA that gives MS the right to do whatever they want or the “you don’t own the OS” arguments that always pop up. I’m talking about fitness for purpose and ethics, not what MS can get away with legally. It’s quite evident that they can get away with just about everything! What they can do and what they should do are different things, and this ongoing license checking is one of those things that they should not do, as I see it. I’d oppose the use of a customer’s hardware to try to invalidate their paid license even if the false positive rate (in terms of detecting pirated installations) was zero. In principle, the OS can’t have two masters. I’ve tolerated this transgression (meaning that I still used Windows even though I knew about this) ever since it first appeared during the XP days, when “Windows Genuine Advantage” (WGA) first appeared, but I’ve always thought it should not be there. Of course, if we move from the principle argument to the nuts ‘n’ bolts, the actual false positive rate is not zero, and never has been– the difficulties with Windows deactivating wrongfully have existed from the start of Windows Activation Technology (the successor to WGA). This is just one more example of that. Since Win XP, all Windows computers automatically check-in with M$ Activation servers during every Log-in, eg if more than 1 hardware components have been changed, this will be detected by M$ Activation servers and OEM-licensed Windows will fail activation. What happens with computers that are not online when fired up? An unsuccessful attempt to contact the server is one thing. It would seem that an unsuccessful attempt to validate the license would bring more serious consequences, perhaps if repeated a few times. The logical conclusion would be that all computers must be connected to the internet. That clearly is not the case. It’s possible to be offline and purposely stop M$ Activation Servers from checking the Windows computer but most Windows users need to be online to remain up-to-date and to use their computers. This may be interesting. On betanews they mention this whole c***, and link to the Reddit thread that started the complaints. I upgraded from Window 7 Pro to Win 10 Pro during the free upgrade period years ago so I didn’t have a product code for Win 10 Pro. So they asked me for my Win 7 Pro key, which luckily i still had, on the back of the box it came in. When i gave it to them they said it’s an OEM version (it is) and that I’d need to show them the invoice I got when I paid for it. I don’t have that piece of paper any more so they said there was nothing they could do for me. Woody, can you figure out if this bug has any effect on system integrity, installed software, virus scanners etc? Will we have to do a reinstall or restore earlier images to be sure? I did not see the warning pop up today, but my Win 10 system was only on for a short while. Didn’t check of course the status of my license, yet another thing to add to the daily checklist belonging to Windows 🙁 Of course, I am not going to fire up this machine again, too risky. When exactly the problem started? And are really all the upgraders affected? I’m on Win10Pro upgraded from Win7Pro a few years ago (now running 1709) and I read this on my smartphone first (from ElReg then from AskWoody) and was able to unplug the internet on my Win10Pro computer before I turned it on today. So far I’ve not seen any problems so I assume it’s an activation check on bootup today that causes it, and not a ‘fall back to Home if activation isn’t confirmed’ bug introduced with last months updates. Happily I have the smartphone plus a Linux computer for any internet efforts, so the Win10Pro can sit internet free for the time being, days if necessary. It’s not lost on me how useful a standby Linux computer has become lately. I was reading the Reddit thread on this and someone mentioned 1709 not being affected but didn’t mention any sources. Anyone else seeing this? got to love the El Reg title in your link, says it all, thanks. Ascaris has written that having to live with pirated versions of Windows should be, for MS, another part of the “cost of doing business.” Unfortunately, the cost of doing business while allowing pirated versions of Windows is huge, because the pirating of versions of Windows — and of so many other things, but Windows in particular — is a huge industrial-strength operation, as it has been for many years already. In a way, we are together in this, MS and those who use Windows, in that we are impotent to stop the root-cause of inconveniences such as the one discussed here: the crazy juggernaut of copyright crime amplified manifold — and only just one part of the even larger issue of cybecrime, plus such things as the diffusion of lies and malintentioned rumors that undermine democracy — by the hard-to-police-effectively interconnectedness that has (with the best of intentions, but with scary unintended consequences) been brought into the world along with the WWW. And that, at Silicon Valley and points beyond, some enterprising people are working overtime to “improve on” by bringing to market, as quickly (and immaturely) as possible, interconnected cars and the IoT. So I am in full agreement to those who are proposing the alternative of runing Linux instead of Windows, a non-commercial version that can bring no gains, legal or illegal, to software pirates and their like. And, for those who choose to stick with commercial OS because of the users’ services and protections provided by the makers to their supported versions, then Macs might be another possibility. What I wrote was that MS is free to do whatever they like to validate a Windows license prior to activation. Once it’s activated, there should be no further use of my personal PC to try to find an excuse to harass me. It’s Microsoft giving people the okay (generally because they are not using a pirated copy) for a given installation and then later deciding to change their minds and deactivate a copy of Windows they’ve previously said was legit that isn’t okay. Ascaris, I do agree with you there. I was commenting about MS motivation for hunting for non-registered versions, i.e. pirated ones, in the first place. As I see it, the issue is not that they do checks of users’ registrations, but why is that they need to do it more than once. For all I know, there might even be a good reason for doing this, but, if so, MS has been keeping mum about it, which is not exactly a good way to endear themselves to its users. Or a very respectful way to deal with people, particularly paying customers. And most specially when they do it so badly as they are doing it now and bothering people so unnecessarily because of it. Hello, knock knock, anyone up at Microsoft even know what’s going on anymore?? Good grief it just keeps getting better. You can’t make this stuff up. Win10 Activation Servers are not the only ones hosed. The Microsoft Update / Windows Update servers out of Windows 7 have been hosed since at least 11/07/18 on all four of my W7 machines. The logs show connection to the servers okay but the process errors out (WindowsUpdate_8024402C error) when WU actually searches the servers for updates. MU / WU was working fine on 11/04/18. Servicing Stack is up to date. Rolling back to August and September pre-update disk images has made no difference so it’s almost a certainty the problem is on MicroSofts end. Anyone else having issues with W7 or W8 Update??? You know it’s authentic because of the one ‘s’ in succesfully. If this suggests MU/WU works in some cases but not others, I hope it is helpful. Timestamps included for comparison. Microsoft will tell you that only a few Windows 10 Pro customers are affected. So it’s no biggie… and the media parrot this nonsense. They also don’t care that what they do is a crime in quite a few countries. The arrogance of Microsoft. I think they have a LOT to share and explain. How is it possible that they get away with major flaws and mismanagement of issues time and time again without having to explain a single word? I think that is not even legal. Today I too see this “Water Mark” message about activation. I’m located in the UK. That sounds just fine to me. Whatever ends up being the new order, it seems quite apparent that Windows, as we’ve known it, is on its way out. Even the most locked-in people won’t tolerate this continued pain train forever. New versions of Windows have often had a rough start, but usually they’ve settled down and become stable by the third year. That’s not happening now, and as long as MS insists on cramming features no one wanted into it so the marketing guys have something to promote every six months, it will not happen. For those interested, I have been running 1511 and 1607 computers always offline since a very long time and I never experienced any activation issue. I so have to wonder, was MS’s activation server hacked? If so, that would be one heck of a news story! Ok, but do we have a signs of that happening on Windows 10 Pro upgraded from Windows 10S? woody on Bott: Win10 apps – which are worth keeping, which should you dump? warrenrumak on Bott: Win10 apps – which are worth keeping, which should you dump? Charlie on Are Robots invading? Lugh on Bott: Win10 apps – which are worth keeping, which should you dump? b on Bott: Win10 apps – which are worth keeping, which should you dump? ch100 on Bott: Win10 apps – which are worth keeping, which should you dump? Bott: Win10 apps – which are worth keeping, which should you dump?